There is a subculture of the homeless in this city whose membership is growing at an alarming rate. Like their more familiar elderly counterparts, they live off the city’s excesses—unwanted canned food, jangling change, and the short shrift of fleeting compassion. They refute popular notions that say they’re simply an inchoate mass of social fallout: a group of aging deadbeats, unbalanced addicts, hoboes, and bag ladies, who choose, out of some maniacal independence, a life on the street. A trip into New York’s netherworld reveals a wholly different and disturbing truth. Beneath the filth and wasted hopes, behind the vacant eyes and apparent stupor, often these are young people. Young people, in their 20s and 30s, who may be the saddest of all those on the street—with all their dreams deferred, unable to keep up with their own generation. Inexplicably, thousands of able-bodied men and women have lost the ability to support themselves, and these young people are part of the fastest-growing sector of the homeless population. In 1968 the median age of shelter clients was over 50; by 1978 it had dropped to 41. Today, strikingly, it’s 34. Not only are the homeless getting younger, they’re also becoming increasingly coed. In the 60s, regardless of age, shelter populations were exclusively male; today women make up 10 to 15 percent of the single adult homeless, and as many of them are under 35 as are older. This doesn’t even count the thousands of destitute younger women who often languish for years in welfare motels with their 12,000 children. The inclusion of these children and young blacks between 18 and 29—one of the fastest growing segments of the homeless—guarantees that the median age of the homeless will continue to drop even as the average age of the general population surges upward. The mere presence of these young homeless is bewildering, their origins obscure. They have a decidedly tenuous connection to familiar street stereotypes of the past. Sometimes they make up stories. They claim to be near 50 when they couldn’t be more than 30. The street ages them swiftly, and they’re embarrassed, so they lie or they hide. Not long ago I spent some time trying to find out what I could about their plight, their emptiness, their despair, and their unseemly slip from respectability into disrepute. They are, after all, my age. 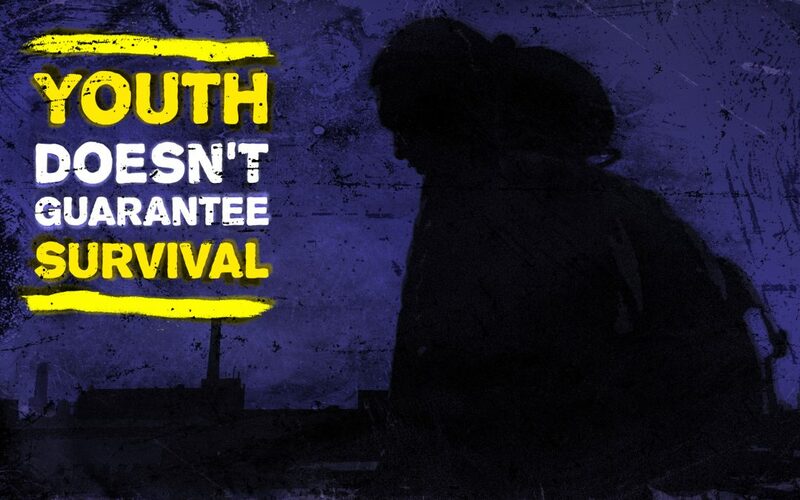 One thing I learned for sure: youth doesn’t guarantee survival. It’s a weekend in mid-March, and the chill has given way, at least intermittently, to milder weather. Joseph Austin, 28, waits on the corner of Broadway and East Tenth Street, shaking a crushed Dixie cup. One in 20 people looks at him, one in 30 stops and drops something in. His donations usually come from people with loose change, not from those with closed purses and briefcases. Nothing ventured, nothing gained. By the end of the day, Joseph will have between $20 and $60, if he hasn’t taken a long rest. Joseph hides his thin Rasta braids under a fisherman’s cap. His eyes won’t meet yours when he speaks, because he’s ashamed of how dirty his skin looks. “I need new skin, a new complexion,” he says dolefully. He is an anomaly in the humid sunshine. A dark ski jacket and heavy black boots make him sweat. His head hangs sheepishly, his round moonface very black, blacker for lack of a place to wash. His once-white T-shirt has a plastic Social Security card pinned on it for identification at the shelter where he lives. He clutches a rolled up bunch of bank applications. Stuffed in his pocket are some more. The applications, another anomaly, are for a NOW account, an American Express corporate card, an IRA, Cushion Credit, and a business reconciliation form. “I gotta find me a address, I gotta find me a address,” Joseph chants over and over. “A address, yeah. Yeah, I need a address. Some place clean that I can dress up and put my clothes and things in I need to be into a house, a better-lookin’ mansion.” Joseph came to New York from Boston, penniless, just over two years ago. He came here because “Boston’s not a handsome city. It’s not a nice-lookin’ city like New York, you know what I mean?” In Boston he lived in welfare apartments. “The housing was dirty, and it was haunted housing. There was roaches all over the table and everything.” Without a room of his own, Joseph can’t clean up. The shelter where he lives doesn’t always have soap. Utterly filthy, he won’t get the type of job in a kitchen that he wants. He fights daily fatigue; it plagues him because he sleeps fitfully and eats only a marginally balanced diet. When he speaks, his mind wavers, more likely from fatigue than from any mental incapacity. He doesn’t see his parents much because he doesn’t have the money to travel, even to Boston. During the day he wanders the East Village and collects change. He buys loaves of white bread, and he searches fervently for that elusive address. They are cliquish, almost clannish, frequenting the same areas by day and night. There’s the Grand Central clique; others at Port Authority, Columbus Circle, the Upper West Side; and a group that lives near the 59th Street Bridge. Some of the men pick up different women each day and go home with them. Others prefer the shelters, and still others prefer the dark corners of parking lots, public bathrooms, and subway stations. Often, after wandering the streets, they return to their chosen spots, for these are their homes. Fierce loyalty and unpredictability, while completely at odds, are integral parts of their lives. “I make more money because Anglos taught me how to speak,” says 34-year-old Robert Matthews (not his real name), who claims to take in $100 a day panhandling. He prefers the pedestrians between West 60th and 80th streets, because they are the most generous donors in the city. “They’ll give you a twenty for opening their cab doors for them.” He exudes an unusual buoyancy and sense of purpose; it’s no secret he’s out there to make money. Frequently he works the four-way intersection, at West 72nd and Columbus Avenue. He grew up in the Bronx, a drifter between foster-care homes. With idiosyncratic logic, he chose to go to Vietnam instead of school: “College is for people who need to be told what to do.” During the war, he says, he worked as a demolition expert. He’s neatly dressed, although his clothes are threadbare. He chainsmokes unfiltered Camels, and his words roll out gracefully. A terrifying scar radiates around the top of his skull like a hair ribbon tied from ear to ear. At a distance it glistens in the light; up close it’s pink and smooth. It came one day in an accidental explosion; he doesn’t remember that too well. He returned from Vietnam with no money, no family, and no vocation. His nights are often spent on the E or F trains, traversing the routes in and out of Manhattan. (The F train has the most heat.) “There are two kinds of people on the street, those who make a buck and those who gave up,” he says. He hasn’t, but he knows of the hordes who spend their energy staking out territory in the halls of Grand Central or Port Authority. “The same people sleep there all the time. They have their spots, in the tunnels and the main room. You can’t just sleep anywhere.” He carries toothpaste and small sample-sized soaps in his pockets. When he needs to bathe, he usually uses the public bathrooms at the Coliseum. Sometimes he’ll opt to spend the night with women. “I feel bad for women. I go home with them, and I give them money,” Robert says. But he always returns to the street. Although many of the homeless read newspapers, most current fears don’t consume them. They tend not to worry about AIDS, cancer, or TB. (TB has spread widely among the homeless due to the close quarters in which they live. Many don’t even know how threatening it is to them, or even if they have it.) Sexuality exists without pretense and without precautions. Bisexuality is not uncommon and doesn’t carry a heavy cultural taboo. Only marginally private, sexual liaisons are carried out in short-stay motels, in parking lots, and on trains. Although some of the homeless drink or take drugs, for many it wasn’t alcoholism or addiction that drove them to the street. The first thing they spend their money on is cigarettes. Most buy them before they buy food. (Food is not a popular subject. They eat at the soup kitchens but prefer pizza or free food donated piecemeal from local greasy spoons.) Many chainsmoke, and conversations usually commence amid clouds of smoke and shared butts. A terrifying scar radiates around the top of his skull like a hair ribbon tied from ear to ear. At a distance it glistens in the light; up close it’s pink and smooth. It came one day in an accidental explosion; he doesn’t remember that too well. When women check in at 350 Lafayette Street, the central warehouse for homeless women, they are usually sent to 68 Lexington. (Over half the women who check in are under 40; 40 percent are white, 44 percent black.) Most are fully aware that it’s the most comfortable and the safest of the women’s shelters. If they get “violent” or caught in drug-related incidents, they are transferred immediately to Bushwick in Brooklyn or to East 51st Street, less desirable women’s shelters. (A favorite of the women at 68 Lex was Dizzie Lizzie, a 22-year-old sprite with dark hair, a crooked smile, and a distorted, Michelin-man shape from the down vest she always wore under her clothes. Lizzie has epilepsy, so she’s given to uncontrollable fits. After a few of her more violent seizures, she got into a fight with a security guard and had to leave the shelter. Now you can find her at East 51st Street during mealtime or in Grand Central on a back bench in the dingy waiting room.) Bushwick reportedly has a large lesbian contingent. “I heard it’s hard, the girls are freer, more lovers are there,” Connie says. “If you want one, that’s the place to go.” Rumor has it that the food is better at the 51st Street shelter, where pancakes and sausages at breakfast are a big draw. At 68 Lex, 210 women and the U.S. Army’s 102nd Battalion (which is headquartered there) coexist relatively peacefully. Men in uniform usually leave the “clients” alone, and any cavorting seems to be a welcome reminder of gender rather than an intrusion. Otherwise, sexuality here is repressed; chastity is the official rule of shelter life. Women cannot bring “companions” up to their rooms, and even if they could, these romantic moments wouldn’t be more than semiprivate. Relationships, particularly ones involving homeless men, are exceedingly frustrating. Television is a welcome escape. In the TV room, rows and rows of black vinyl chairs hold women with glazed eyes. “They watch TV. They watch stories all day long; stories come on at 12:00 p.m. They watch from about 12 to four; after stories then they have dinner; after dinner the VCR goes on. That’s all they do,” says Connie, shaking her head. Some of the women, like Connie, find the TV tiresome and opt to go to work. In a culture where identity and occupation are almost indivisible, the homeless are estranged. Many hold down jobs, commuting to work from various shelters. They earn about minimum wage as housekeepers, home health aides, garage attendants, and foot messengers. Their less-than-tolerable living conditions often hamper their job performance. They are unable to think clearly, read clearly, or know exactly where they’re going, because, often, they’re painfully exhausted. Late into the night, screams punctuate their restless sleep. At 68 Lex, shelter clients sleep in a cavernous room called, appropriately, the drill floor. The dormitory is an overwhelmingly institutional gray, with illegible graffiti scrawled along the walls. Rows of narrow beds stretch across a space three-quarters the size of a city block. It’s 2:00 in the afternoon, yet many of the cots are filled. “They feel that they can’t make it, ya know, that they’ve been kicked around so much, and here everything is provided for them,” says Connie. Some have pictures of “crushes” taped to their headboards. One woman drives the point home with three pictures of Tom Cruise. In a culture where identity and occupation are almost indivisible, the homeless are estranged. After three months of sleeping on the drill floor, Connie traded up to a semiprivate room, the most private this shelter has to offer. “When I first came, I was bed 212. Now I’m bed 70, 12 people in my room,” she says. A zoo of stuffed animals waits on her hand-knit quilt. The beds spread out across the room, with 10-inch-wide lockers between them. “You’re only allowed one locker, but I have more than one. They say, ‘This is a shelter, it is only a temporary thing, it’s not supposed to be you come and stay here forever,’” says Connie. Pictures of Martin Luther King, Jr., are tacked to the walls, so numerous they’re almost gratuitous. Harlequin Romances lie everywhere, tossed around the room with a vengeance. The existence of the young homeless cannot, in good conscience, be explained by the mass federal and state deinstitutionalization policies of the early 70s. “Most of those people are in old-age homes or dead,” says Beth Gorrie, associate director of the Coalition for the Homeless. “The large majority of those who are homeless today can’t be tossed off as merely mentally ill.” A recent Human Resources Administration study states that 30 percent of 10,000 single adult homeless** report that they’ve had mental disability or hospitalization. Of that 3,000, the report recommends that about 750 need hospitalization or therapy. Simple mathematics divines that the vast majority of the homeless are not mentally-disabled. Sadly, for those who do need it, care isn’t always readily available. **Depending on which agency you choose to query, the number of homeless in New York City varies wildly. HRA estimates there are up to 27,000 in shelters. They don’t document the rest. The Coalition for the Homeless estimates there are between 60,000 and 80,000 homeless. He admires Mel Gibson and likes to mimic the overblown excitement of the actor’s psychedelic violence films (Mad Max, The Road Warrior). He wanders the streets with his music box blasting, and he stops for a few hits of sinsemilla. “I like everything about it [the street]. It’s fast. It’s daring.” Even though David dropped out of high school, he’s developed a personal reading list of classics and comic books. He alludes to Candide, Victor Hugo, and Thor with equal enthusiasm. Obviously bright, he bursts with loaded metaphors and non sequiturs: “We’ve been playing chess. All right, I have ten pawns, a rook, a knight, a bishop, a king, a queen, all right. What’s gonna be your first move?” He smiles. “I’m black and you’re white. White always goes first.” He’s not too far off. Roughly 85 percent of the homeless singles in New York are of black or Hispanic background; the remaining 15 percent are white. Larry Dunlop (not his real name), another Vietnam vet, lives in a parking garage on West 59th Street. He sleeps with blankets on the cement near an older black woman called “Mommy.” His speech is forceful, his mind seems acute. It’s hard to discern, even for him, why he prefers the street to a shelter. “It’s really strange. Like sometimes you get accustomed to it, you get used to it, you know what I’m saying? ’Cause I been in jungles and in firefights … this is nothing compared to what I’ve been through.” Larry prefers life on the streets to the violence, theft, and lack of freedom at the shelters. He is not alone. Larry prefers life on the streets to the violence, theft, and lack of freedom at the shelters. He is not alone. With a less than 1-percent vacancy rate in New York City, it isn’t too surprising that the homeless have difficulty finding apartments. In New York, over 5,000 city-owned buildings and 60,000 privately owned apartments stand empty, a testament to poor planning, profligate spending, indecisiveness, and greed. City and state agencies spend close to $1,000 a month on each person living in the shelters. “I can only tell you that no matter how I explain it, it sounds as ridiculous to me as it does to you,” says Stella Schindler, director of the Mayor’s Office for Homeless and SRO Housing Services (she is often called the czarina of the homeless). “The law says the money can only be used for temporary accommodations, for hotels, motels, shelters—short stays. The funds cannot be used to build apartment buildings.” She insists, “We’re not in the business to make millionaires out of hotel owners.” But they do. Both hotel owners and developers profit mightily from the present system. The city has, thus far, failed to successfully rally for changes in federal law. Gorrie, of the Coalition for the Homeless, defines the real problem. “They are anemic lobbyists. I was at the last budget meeting. Not one HRA senior staffer was even there. They don’t pressure the New York City budget council. It’s very hard for me to believe they’re at all effective in lobbying Washington.” Meanwhile, a coherent policy toward the homeless—both the young and the old—continues to elude us. The mixture of naïveté, nihilism, and a city geared to taxable entities begins to explain an overwhelming failure. The city grievously lacks the creativity needed to serve individuals of an enormous, varied population. The young homeless, who vary from almost incompetent to somewhat capable, are a lost part of my generation. Fate has been harsh to them, and they are universally depressed. While they’re mired in fatigue and indifference, life, predictably, passes them by. I don’t know quite what I expected when I first approached them. More often than not, after they felt comfortable with my concern, their words came out in a flood. A lot of them didn’t understand my interest. They didn’t feel worth a lengthy discussion. Many said, “Why do you want to talk to me?” A conversation usually went on for a while until he or she felt too weary to continue. Once, as I got ready to leave, a young man seized my shoulders and then gave me a quick kiss on the cheek. The kiss would have landed on my lips if shock hadn’t sent my head flinging to the side. And then, before I could recover, he spotted a friend and rushed over to him. He walked away with one arm around his friend. With the other he waved goodbye and never looked back. We were separate again.